This article is about the neighborhood in San Diego. For the borough of Tijuana, see Mesa de Otay. Otay Mesa (/ˈoʊtaɪ ˈmeɪsə/ OH-ty MAY-sə) is a community in the southern section of the city of San Diego, just north of the U.S.–Mexico border. 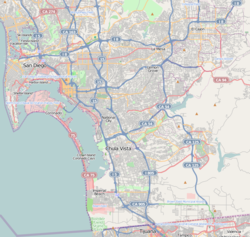 It is bordered by the Otay River Valley and the city of Chula Vista on the north; Interstate 805 and the neighborhoods of Ocean View Hills and San Ysidro on the west; unincorporated San Diego County on the north and east including East Otay Mesa and the San Ysidro Mountains; and the Otay Centenario borough of Tijuana, Mexico on the south. Major thoroughfares include Otay Mesa Road/California State Route 905, Otay Valley Road/Heritage Road, Siempre Viva Road, and California State Route 125. Otay Mesa is the second-least walkable neighborhood of San Diego. Otay is derived from the Kumeyaay language. Although its meaning is disputed, possible derivations include "otai", meaning "brushy"; "Tou-ti" meaning "big mountain"; or "etaay" meaning "big". Mesa is the Spanish word for plateau, table or tableland. The area which now includes Otay Mesa was annexed from San Diego County along with other portions of South San Diego in 1957. Additional annexation of almost four thousand acres was approved in 1985. Since 2010, seven cross-border tunnels have been found linking Warehouses in Otay Mesa with entry points within Mexico. The Otay Mesa Port of Entry is one of two border crossings within the city of San Diego, the other being the San Ysidro Port of Entry six miles to the west. Trucks are generally instructed to use the border crossing in Otay Mesa instead of the San Ysidro one. Otay Mesa also houses an immigration detention center. Two miles east of the Otay Mesa border crossing in the unincorporated area of East Otay Mesa, the new Otay Mesa East Port of Entry is planned to be in service as early as 2023. There is also the Cross Border Xpress (CBX), a terminal serving and a pedestrian bridge crossing to the main terminal of Tijuana International Airport, which opened in 2015. This crossing has a 45,000-square-foot (4,200 m2) facility in Otay Mesa. It was established by Otay-Tijuana Ventures LLC and had a cost of $78 million. CBX makes Tijuana Airport the world's first geographically binational airport, because unlike the binational airports serving the Swiss cities of Basel (entirely on French territory) and Geneva (entirely on Swiss territory), the CBX terminal is physically located in the United States but serves an airport whose main terminal and runways are in Mexico. Located 1.5 miles north of the Mexico-United States Border, is the 603 megawatt Otay Mesa Energy Center, which came online in 2009. This power plant will be joined with the Pio Pico Energy Center peaker, which will generate an additional 300 megawatts. Pacific Gateway Park is located between Otay Mesa Road and the international border. ^ "Otay Mesa neighborhood in San Diego". Walk Score. ^ a b Fetzer, Leland (10 July 2018). "San Diego County Place Names, A to Z". Sunbelt Publications, Inc. – via Google Books. ^ "Otay Mesa Nestor". Development Services Department, Planning Division. City of San Diego. Retrieved 16 January 2013. ^ Michael A. Fairley (27 February 1985). "Annexation of Otay Mesa Land Approved". Los Angeles Times. Retrieved 16 January 2013. ^ Whitcomb, Dan (4 April 2014). "Two drug tunnels, with rail systems, found at U.S.-Mexico border". Reuters. Los Angeles. Retrieved 4 April 2014. ^ Elliot Spagat (26 May 2010). "Health official tours San Diego immigration jail". San Diego Union Tribune. Associated Press. Retrieved 16 January 2013. ^ Dibble, Sandra (2015-12-09). "New Tijuana airport bridge opens". San Diego Union-Tribune. Retrieved 2017-01-18. ^ Dibble, Sandra (2012-11-28). "Tijuana's airport preparing for cross-border bridge". San Diego Union-Tribune. Retrieved 2017-01-18. "The company operating the A.L. Rodríguez International Airport is a key player in a plan for a privately owned terminal in Otay Mesa that would allow ticketed, toll-paying airline passengers to cross between San Diego and Tijuana." ^ Dibble, Sandra (2010-08-04). "Cross-border bridge gets federal permit". San Diego Union-Tribune. Retrieved 2017-01-18. ^ "Otay Mesa Power Plant Licensing Case". California Energy Commission. State of California. 3 October 2009. Retrieved 16 January 2013. ^ City News Service (12 September 2012). "California Energy Commission Approves 300-Megawatt Natural Gas Power Plant". KPBS. Retrieved 16 January 2013.